I’ve now been lucky enough to run in all parts of the world, in immensely differing conditions. From deserts, to icy glaciers. From Siberia to South Africa.. I’ve run marathons, ultra marathons and 7 day multi stage races.. But this took time and I built myself up to the challenges..
I’ve had a number of people tell me how they were inspired to take on challenges as a result of my efforts.. This is a huge honour and I have seen these friends and strangers lift themselves up above their own expectations and smash through their own adventures. Sooner or later, many of these people will surpass my own achievements and go on to set new benchmarks for humanity..
Last year a few mates took on the Kokoda 96km Challenge in the Gold Coast hinterland. 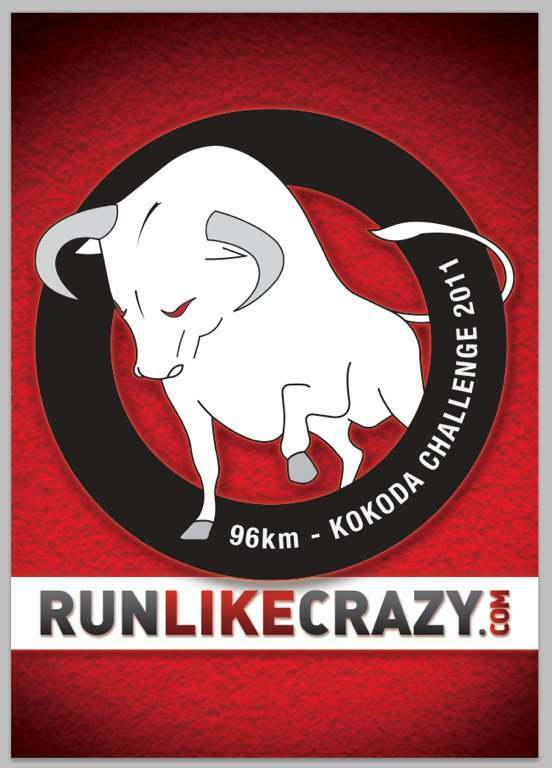 The name is taken from the heart breaking Kokoda Trail in Papua New Guinea and the course is designed to smash you to pieces in just the same way. One hero, Cameron Blair, made it over 80kms before the course got the better of him. In 2010, only 55% of teams made it to the finish line with all 4 members..
What I love about Cam (apart from his good looks and his astonishing dance moves) is his powerful fortitude and his inability to be defeated. He was knocked down by the race last year, but he has lifted himself off the canvas and will be attempting to out box, out maneuver and out last the Kokoda course this year – starting at 6am tomorrow, Saturday 16th July! He has put together a new crew, once again branded it with the famous RunLikeCrazy Bull and will head into the jungle with head held high and his heart as strong as a, dare I say it, MIGHTY BULL!! I know two other members of this four man team. Cristian Alex is a part time tennis champ, casual model, part time night-club manager and full time SUPER HERO!! He has been training like a demon and tomorrow is his time to shine. He’s been calculating the course and seems intent on breaking the course record! With an attitude like that, only good things can happen. Jarrod Holt is ALL GO and absolutely no halt. He’s been the outstanding runner of the group in the months of training it has taken them to get here. I have no doubt he will be leading the charge for at least the first 50km. Jarrod is simply UNSTOPPABLE!! The last of the team is a man yet unknown to me.. But I understand he has the heart of a STALLION and the body of a GOD (especially in lycra)!! He’s know to his friend as Charlie “CAPTAIN WOW” Parker… need I say more?!?! The team will pull together, rally and fight to push through to the end. You do me proud to wear the Bull on your frontage my friends. I will be watching you with great interest as you push toward the 24 hour goal you have set for one of the most gruelling races in Australia!! Go well… be strong… STICK TOGETHER!! A Google Earth Tracker will be added to the site tomorrow. I’ll connect it to the post and you can all check their continued progress.. In the meantime, check out the site for the huge challenge on this link!